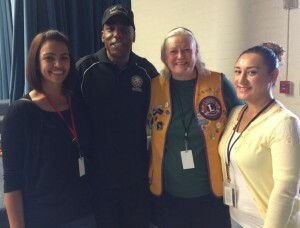 This year West Covina Lions provided free eye screening for 3434 students in West Covina schools. The grades tested are kindergarten, 2, 4, 6, 8, and 10. The schools we visited were West Covina High School, Edgewood High and Middle School, San Jose Academy, Monte Vista Elementary, Merlinda Elementary, Vine Elementary, Wescove Elementary, Cameron Elementary, Orangewood Elementary, Merced Elementary, California Elementary, Walnut Grove Elementary, and Hollencrest Middle School. Our Club will help two children from Hollencrest Middle School obtain glasses that their parents cannot afford. West Covina Lions who assisted with these screening are Dr. Thear Bun, Jake Chik, Mario Del Fante, Anna Lee Farber, Donald Luey, Lisa Mayo, Paul O’Brien, and Vision Screening Chair Vicki Scheliga. Pictured from left are a volunteer mother, School Board member Mike Flowers, Lion Vicki Scheliga, and WCUSD Nurse Cynthia Hernandez. NOTE: The West Covina School District nurse can refer any child whose parents cannot afford their child’s eye care to Lions. We will cover the cost of their eye care. The child must either live or go to school in West Covina.